A limnic eruption is a sudden release of suffocating, inflammable gases from a maar, a lake in the crater of an extinct volcano, which is saturated with carbon dioxide from underlying magma reservoirs. 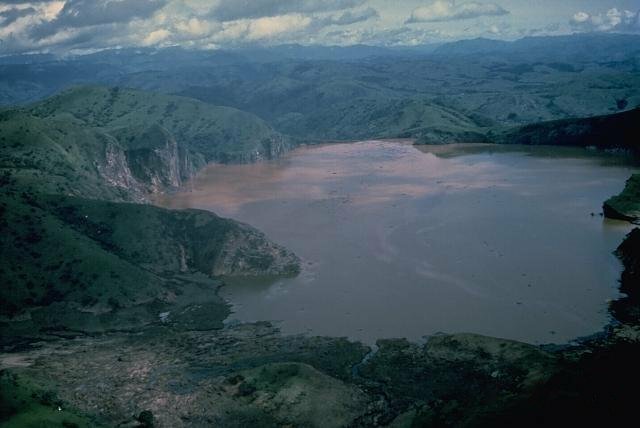 A limnic eruption is a very rare natural event, disastrous effects have been recorded only two times, both times in Cameroon, 1984 at Lake Monoun, causing the death of 37 persons, and 1986 at Lake Nyos, taking the lives of 1700-1800 people. Denser than air, a cloud of 1,6 million tonnes, a cubic kilometer, of CO2 flowed off the mountain into surrounding valleys, suffocating people and animals.